The past few years have been tough for 3D printing stocks, but the future may be extremely bright. Investing in 3D printing stocks has been tough the last few years as growth and profits didn't turn out quite as planned. As you can see below, 3D Systems Corporation (NYSE:DDD), Stratasys, Ltd. (NASDAQ:SSYS), and ExOne Co have all plunged at least 70% in the last three years as investors adjusted to newly lowered expectations. But before giving up on the industry, investors should look at the kind of growth these companies could have ahead. 3D printing may just be getting started. 3D printing has gotten a lot of new publicity over the past few years, but the market is just now maturing and starting to grow consistently. Deloitte Poland estimates the current global 3D printing market was $4.8 billion last year but will grow to $20.5 billion by 2020. Part of the new stability is the consolidation that's left Stratasys and 3D Systems with a larger market share. As the market grows, these two companies are hoping to ride the wave of 3D printing adoptions to higher revenue and earnings. What 3D printing companies really want to do is get manufacturers to start using their products for regular business or small-volume production runs. If their products are built into the manufacturing process, it would lead to a high volume of resin sales, which are high-margin products for 3D printing companies. It's also recurring revenue, as opposed to one-time equipment sales. There's some significant progress on that front, with Stratasys signing deals with both Airbus and Ford. 3D Systems has been used by Mitsubishi and Daimler as well, so these companies are slowly being built into the design process. And these partnerships just scratch the surface of companies expanding 3D printing capabilities. What was often lost when 3D printing stocks were hot a few years ago is that the process of designing and manufacturing new components is often years long. And when you're talking about upending the process itself, the wait to gain traction in revenue can be even longer. Ford's decision to begin using 3D printing for custom parts and customization is something that takes a long time to get a company to do, and we're only now starting to see the progress. 3D printing has been around for decades, but a big reason the market has become viable in the last few years is the improvement in materials. When I first started 3D printing parts in the early 2000s, the parts were fragile and expensive, which meant use cases were limited. Now, metals are becoming commonplace in 3D printing, opening up a new world of opportunity. The industry is still in a nascent phase, but if you look at the years it took to gain traction in plastic materials, this is just another growth path in the long term, even if it takes years to become a big industry. One thing 3D printing metals shows is that this industry has a huge opportunity ahead. The technology is still improving, and companies are still figuring out how they're going to use 3D-printed parts, but for investors there's an opportunity to own some of the dominant stocks in 3D printing before we reach an explosive growth phase. The last few years haven't been good for 3D printing stocks, but that doesn't mean the future won't be extremely bright. 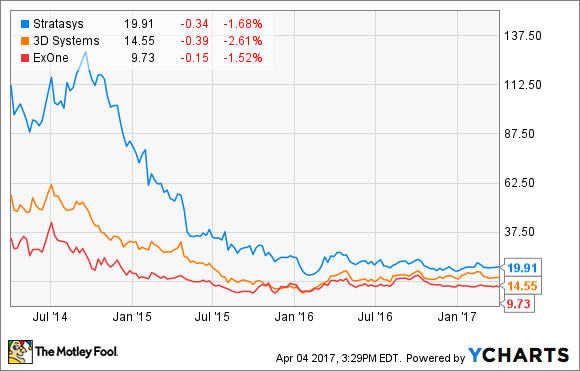 Is 3D Systems Stock a Buy?